The other day I picked up my medication from the pharmacy and laughed when the handed me over a shopping back but then went back for another one!!! I know all the people in my pharmacy well and will always have a chat with them but I have never really told them whats wrong with me. They know I have asthma but they don’t know much about it etc, until the other day when I hadn’t been in for a while. I collect my dosette box weekly from them and will get a top up of inhalers etc every so often. She asked where I had been so I told her I had been in hospital and thats hy hadn’t been in. She was shocked. She said she didnt realise just asthma could do that to someone. I went on to explain a bit more about it and how it impacts me and explained what all the meds I take are for. She said she ha wondered as didnt think asthma could be like that. She said it must be hard but its life. Life for everyone is hard at times but it is what you make out of it. I have days where I really resent having asthma and wish I could go back to primary school I think P3 was when I was on just one preventer and a reliever and that was it. That would be wonderful but then what would I have achieved in life if I didnt have the difficult asthma. I am sure I would be proud of my life but Im not sure I would have done nearly half of what I have done and a lot of it is because of my asthma such as publishing an article in the BMJ, playing for Scotland in the Home Internationals, be back as a goal keeper in lacrosse, speaking at so many events, speaking on a masters course at Edinburgh Uni, being a nurse, being development director for Lacrosse Scotland, being a PPI lead for AUKCAR, being a RaP volunteer at Asthma UK. None of these things I would have done and I also would not have met some fantastic people on my way and made some great friends. I am thankful for my asthma to have given me these oppeturnities inspire of also giving me some of the hardest times in my life and living with the fear that it could kill me one day. (but then as my mum says you could cross the road and get knocked down by a bus so you never know what is runs the corner!!!! I would love for a day when my breathing is a little less challenging and a little less limiting but I think in a small way I am glad it has shaped me the way it has. 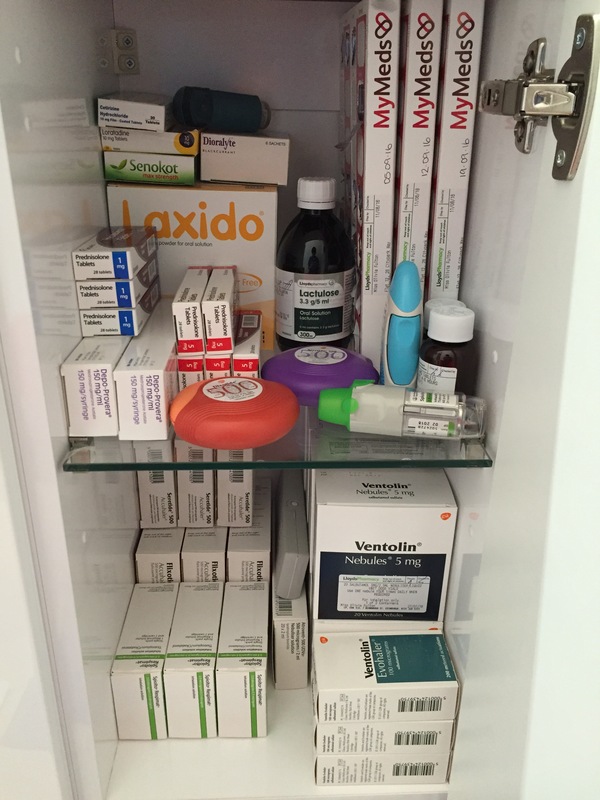 The reason I wrote this out was because I just picked up my meds as I wrote in the start and I organised them into my cupboard to make them all neat and so I know what is where. I was getting lost with the meds and what I was taking when. It was over whelming but my pharmacist has reduced that a lot by sorting my meds out weekly but they were also all in a box just chucked in so never knew what I had and what I was running out of. Now they are neat in a cupboard which I can close the door on. Closing the door- after some carful tetris packing because it wouldn’t shut the first time round, made me think about what we hide from the outside. What is our own reality and what is the reality that we allow people to see. My life on the outside is very different to life in my flat. I find when I am at home I am resting and doing treatment to allow myself to go out and about and be with friends or coach or something else. It is like two polar worlds- one which is in preparation of going out or the recovery of being out and then the being out and doing things. Its keep the private and the public separate until you read this and realise that asthma is not just asthma but it is much bigger. It is life changing, life threatening, life limiting. But take each day as it comes and rise to the challenges that are thrown at you and achieve what you dream of achieving as it is always possible it just has to be achieved in different ways with some imagination sometimes. For instance I always wanted to play lacrosse for Scotland but never did I think it would be achieved by being in the goal, I thought if it was to happen it would be playing out field. Life is for living not watching it go by in front of you!